General Information: Peewee Fingerlings are a great item for any menu because they are a full-flavored potato in a small size. Peewee Fingerlings are harvested when very small. Generally measured at less than two inches long, they taste like a fully developed potato. Not to be confused with marble potatoes, Peewees are a smaller version of the fingerling varieties and a delicious addition to any meal. 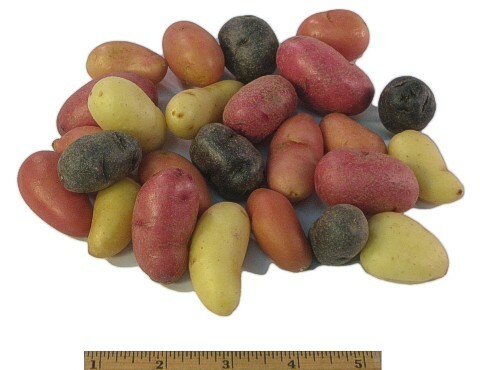 These potatoes can be any type of fingerling potato and their colors are red, white, gold and blue. They are defined by their size, not by their variety or color. Good source of fiber and vitamin C.